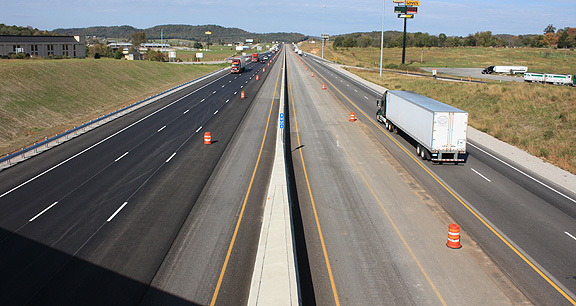 Project obstacles and solutions: The widening of I-65 from the Tennessee state line to Elizabethtown, Kentucky encompasses 91 miles of highway. The latest stretch of the project covers over 25 miles of the highway. It includes adding an additional lane in both the north and southbound directions, constructing a concrete safety barrier wall and reconstructing bridges, overpasses and ramps to accommodate the new lanes. Scotty's Construction and Stone has served as the general contractor for this project over the past eight years. IMI has supplied concrete for 63 miles of the project. A project of this magnitude requires mass amounts of concrete that can be delivered around the clock. For instance, the median barrier walls separating the northbound and southbound lanes required 2,000 yards per mile of construction. The walls had to meet minimum height requirements of 52 inches. In the curves, those heights were specified to be up to 96 inches to prevent rollovers across the median. The walls needed to be continuous and to have a fluid lift and fall from one height to another. JBI constructed the walls with a standard slip-form paver. Transitional walls were poured with a form at the IMI Elizabethtown plant and then moved to the work site and set in place. Bridges and overpasses were a big part of this project as well. From the Tennessee state line to Elizabethtown, there are 65 bridges and overpasses on I-65. In this section of the project, Van Meter Contracting and Scott & Murphy rebuilt bridges to accommodate the two extra lanes. IMI provided concrete for the pillars, beams, curbs and barrier walls of each bridge. This section of I-65 is scheduled to open for traffic in November.